Sitting in the house on a hot June evening, I realize that our window fans aren't quite moving enough air through the house. So, I decide to check out some local retailers' web sites to see what fans they may have available. From the home page of each site, I submit a search for "window fan". These are all retailers that have had window fans in their stores in the past. The Home Depot site returns a handful of fans followed by some air conditioners. Although I don't see quite what I'm seeking, these results seem relevant. The Lowe's site returns one window fan followed by a bunch of doors -- doors with windows in them. Not quite what I expected. I expected Lowe's to have more than one window fan option. The Target site shows me several window fans and some curtains. While I didn't expect curtains to be the number two result, I do see a selection of fans. The Walmart site results are just bizarre: one "window fan" for a tent, and dozens of sport team flags. Is there a problem here? 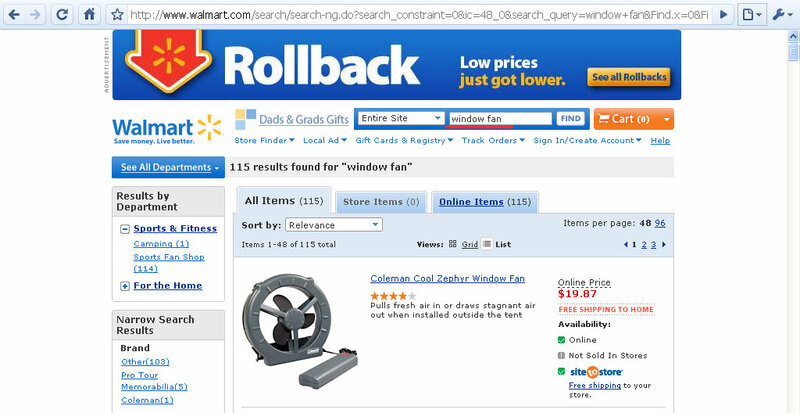 While I don't expect each retailer to sell the exact same models of window fans, I expected to see a bit more consistency and relevancy in the search results. Now, who puts a fan in a tent?